The election campaign has been accompanied by an uptick in felled trees and suspected collusion between the enforcement rangers and the illegal loggers. Cambodia’s general election campaign has been accompanied by illegal logging, local leaders say, which can be a way for political parties to fund their activities. Facing scant and fractured opposition, the Cambodian People’s Party and its leader, Hun Sen, who has served as prime minister for 33 years, were expected to win. Community forestry leaders noted an uptick in felled trees and suspected collusion between the enforcement rangers and the illegal loggers, particularly in July. These groups say that fewer patrols by law enforcement authorities in connection with the general election have allowed the uptick. The sale of timber can help fill the coffers of political parties. The ruling Cambodian People’s Party is likely to retain power, along with its leader Hun Sen, who has held the post of prime minister for the past 33 years. 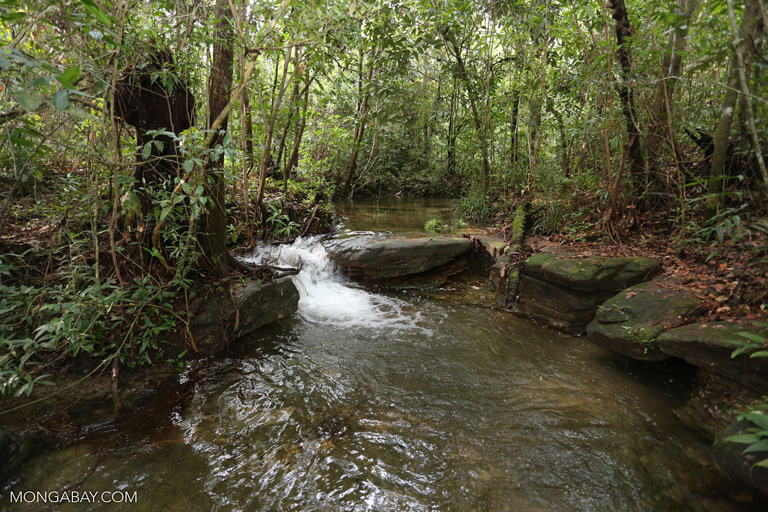 A forest stream in Cambodia. Image by Rhett A. Butler/Mongabay. Local leaders and activists say they’ve seen a decrease in the number of patrols, or that enforcement officials appear to be complicit in illegal logging, the Phnom Penh Post reported. “Some rangers seem less concerned about protecting the forest, and some have conspired to hand over [confiscated wood] to smugglers,” said Hoeun Sopheap, a community coordinator in Kampong Thom. Others said they believed patrolling rangers were communicating with illegal loggers. Between 2001 and 2014, Cambodia’s tree cover loss sped up more quickly than any other country on the planet, according to a 2015 World Resources Institute analysis. That loss appeared to be linked to the clearing of forest to make way for rubber plantations, as rates increased amid rising global rubber prices. Image courtesy of Global Forest Watch. In this case, however, the ultimate goal seems to be the sale of timber. Hoeun Sopheap said a community team turned up some wood and four chainsaws on one of its patrols in mid-July. But a government official contradicted those claims, saying he had seen a lull in logging activity. 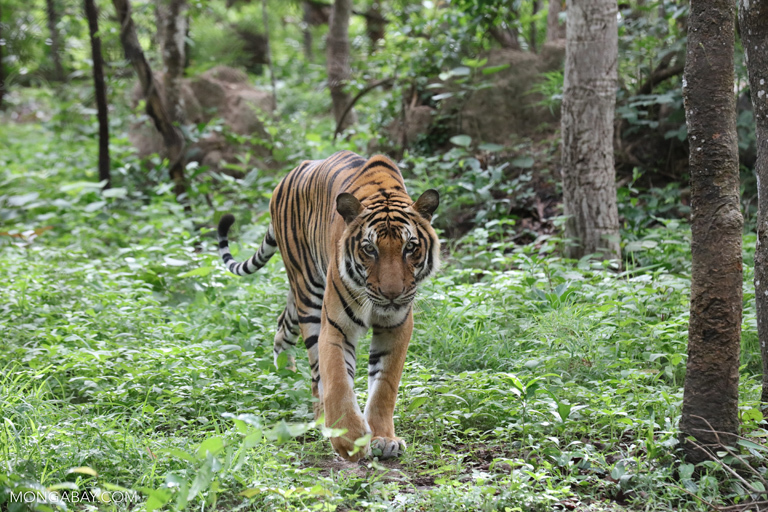 A tiger walks through the forest in Cambodia. Image by Rhett A. Butler/Mongabay. Banner image of a pied hornbill in Cambodia by Rhett A. Butler/Mongabay. Global Forest Watch. “Tree cover loss in Cambodia.” Accessed on July 29, 2018, from www.globalforestwatch.org.